I met a lot of things on the way that astonished me. Tom Bombadil I knew already; but I had never been to Bree. 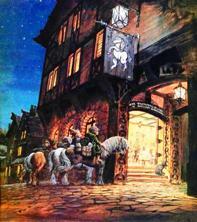 Strider sitting in the corner at the inn was a shock, and I had no more idea who he was than had Frodo. The Mines of Moria had been a mere name; and of Lothlorien no word had reached my mortal ears till I came there.Far away I knew there were the Horse-lords on the confines of an ancient Kingdom of Men, but Fangorn Forest was an unforeseen adventure. I had never heard of the House of Eorl nor the Stewards of Gondor.Most disquieting of all, Saruman had never been revealed to me, and I was as mystified as Frodo at Gandalf's failure to appear on September 22. The Return of the Shadow is the sixth volume of The History of Middle-earth. This is the first volume of the 12 book series that begins to discuss material from J.R.R.Tolkien's masterpiece, The Lord of the Rings, and the reader is in for an eye-popping adventure into the construction of the timeless masterpiece. While Tolkien wrote The Hobbit as a children's book, he states in a letter to Stanley Unwin, dated 7 December 1942, "I ought to warn you that [The Lord of the Rings] is very long, in places more alarming than The Hobbit, and in fact not really a 'juvenile' at all." Here is your road map for the evolution of this timeless masterpiece. Even if you have read The Lord of the Rings once, or many times, hang on to your hat! If you think you know these characters well, be prepared for a world of revelation. Wonderful surprises and illuminating discoveries await you as you follow Tolkien, step by step, through his composition process. This is truly a unique experience that should not be missed. ♦ Before there was Frodo Baggins, there was Bingo, son of Bilbo who then became Bilbo's nephew, Bingo Bolger-Baggins. There was a chapter entitled Three's Company and Four's More. Before Tolkien settled on his famous foursome of Frodo, Merry, Pippin and Sam (Sam being a very late addition, indeed), there were the likes of Odo and Frodo (changed to Drogo) Took, Marmaduke Brandybuck, Mungo Baggins and Rollo Bolger. You will find it a little disconcerting to see your favorite hobbit characters emerging from very different names, but great fun just the same. ♦ When we finally meet the Ranger in Bree, his name is Trotter and not Strider. More importantly, he is a hobbit, not a man. Tolkien keeps the name Trotter and the hobbit nature of this character well into what is now the second book, The Two Towers. Following the development of the character who will ultimately become the future King of Gondor, is absolutely fascinating. Did you know that the first mention of the name of Aragorn is when Tolkien listed it among the initial names for Gandalf's horse? One can not help but be spellbound as Tolkien works his way towards the masterpiece we know and love today. ♦ Undoubtedly, the most fascinating of all is watching Tolkien's process of evolution of the One Ring into the sinister and evil thing that it unquestionably becomes.